Visiting Professor Robert Cordy warns of threats to constitutional democracy. In “Challenges to Constitutional Democracy,” his inaugural address at BC Law School September 5, the former associate justice of the Massachusetts Supreme Judicial Court and longtime promoter of the rule of law in emerging democracies painted a troubling picture of the vulnerability of nations—large and small—to leaders who choose to upset the balance of power safeguarding the citizenry. 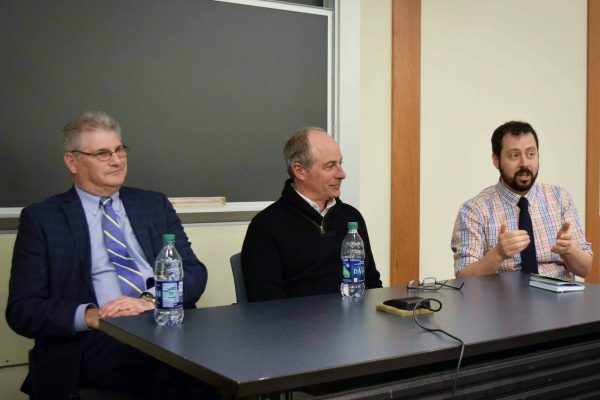 “It is perfectly clear to me that the path to autocracy requires the neutering of these two independent and interdependent institutions,” Cordy said of the press and judiciary. “And down that path go an alarming number of countries—on the ‘razor’s edge’ of autocracy.” One need only look to places like Russia and Turkey—where he collaborated for many years on the establishment of strong judiciaries only to see them gutted by political fiat— to appreciate how quickly and unexpectedly things can turn dark, he said. To set the stage for these conclusions, Cordy traced the history of constitutional democracy to 1780 and the drafting of the Massachusetts Constitution, in which the concept of constitutional democracy first gained institutional and practical form. “For almost two centuries America stood in splendid isolation in its chosen form of government,” he said. That changed after World War II when the rise of constitutional democracies and global institutions ushered in a period of peace and prosperity in Europe and a trend toward freedom through democracy elsewhere. In recent years, however, such efforts have suffered setbacks, Cordy noted, pointing to findings by Freedom House that countries suffering declines in political rights and civil liberties have drastically outnumbered those registering gains in the past twelve years. Cordy discussed at length his initially inspiring and ultimately disheartening experiences first in Russia, then in Turkey, where he and other American members of the judiciary collaborated with their foreign peers to implement adversarial systems of justice, explore the principles of judicial independence, and advance judicial and legal training and ethical programs. In both nations, the government eventually turned on the reformers, bringing progress to a swift, sometimes brutal (in Turkey’s case, many were imprisoned), end. Cordy also noted that the independent press in both countries suffered similar fates. Cordy acknowledged that this requires courage. “When the gauntlet is thrown down and the elected leader and would-be autocrat begins to move on the judiciary and free press, the courage of other institutions to stand up and stand with them” is critical, he said. 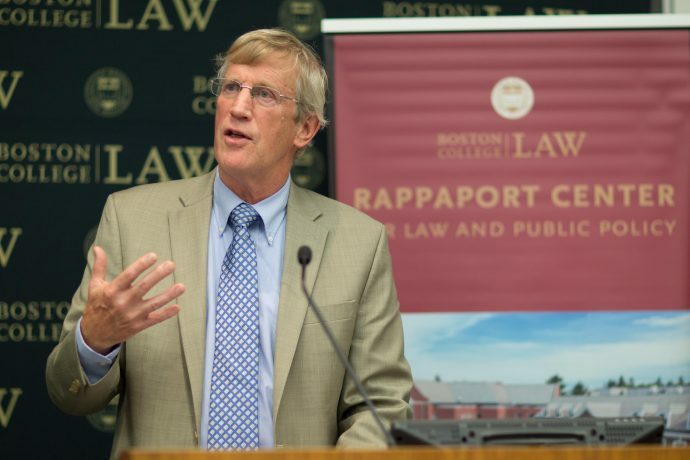 Cordy is in residence this fall at BC Law’s Rappaport Center for Law and Public Policy and is teaching a seminar titled Constitutional Democracy Under Siege.